This month's edition of National Geographic has a feature article on "Soil", which looks at the steady degradation of agricultural land and the problem this poses in world where the population is heading for 9+ billion people - effectively calling attention to the "peak dirt" problem (however soil is renewable, so any "peak" should be able to be reversed if sufficient time and effort is put into doing so). The article uses an acronym I've never come across before to describe the problem faced by those trying to draw attention to the issue: MEGO (My Eyes Glaze Over) - a phenomenon which should be familiar to anyone who has ever talked about peak oil, global warming or any of the other "limits to growth". This year food shortages, caused in part by the diminishing quantity and quality of the world's soil, have led to riots in Asia, Africa, and Latin America. By 2030, when today's toddlers have toddlers of their own, 8.3 billion people will walk the Earth; to feed them, the UN Food and Agriculture Organization estimates, farmers will have to grow almost 30 percent more grain than they do now. Connoisseurs of human fecklessness will appreciate that even as humankind is ratchetting up its demands on soil, we are destroying it faster than ever before. "Taking the long view, we are running out of dirt," says David R. Montgomery, a geologist at the University of Washington in Seattle. Journalists sometimes describe unsexy subjects as MEGO: My eyes glaze over. Alas, soil degradation is the essence of MEGO. One subject that features in the article is soil restoration, including a look at "terra preta" - rich, fertile artificial soils found in the Amazon. In this post I'll have a look at modern day techniques to produce terra preta (often called biochar or agrichar) which have the potential to increase soil fertility, generate energy and sequester carbon all at the same time. 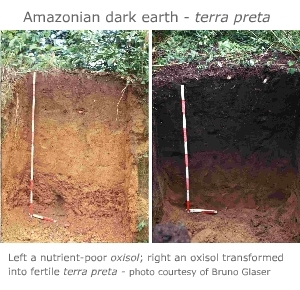 Terra Preta ("dark earth") was discovered by Dutch soil scientist Wim Sombroek in the 1950's, when he discovered pockets of rich, fertile soil amidst the Amazon rainforest (otherwise known for its poor, thin soils), which he documented in a 1966 book "Amazon Soils". Similar pockets have since been found in other sites in Ecuador and Peru, and also in Western Africa (Benin and Liberia) and the Savannas of South Africa. Carbon dating has shown them to date back between 1,780 and 2,260 years. Terra preta is found only where people lived - it is an artificial, human-made soil, which originated before the arrival of Europeans in South America. The soil is rich in minerals including phosphorus, calcium, zinc, and manganese - however its most important ingredient is charcoal, the source of terra preta's color. It isn't entirely clear if the Amazon Indians whose old settlements terra preta is found at deliberately created the soils or if they were an accidental by-product of "slash and smoulder" farming techniques, though the emerging consensus seems to be that the Indians deliberately created the material, with some early European accounts in the area noting the practice still being performed. The key ingredient is apparently the activated carbon in the charocal. Activated carbon has a complex, spongelike molecular structure - a single gram can have a surface area of 500 to 1,500 square meters (or about the equivalent of one to three basketball courts). Having this material in the soil has several beneficial effects, including a 20% increase in water retention, increased mineral retention, increased mineral availability to plant roots, and increased microbial activity. It has also been shown to be particularly beneficial to arbuscular mycorrhizal fungi, which form a symbiotic relationship with plant root fibers, allowing for greater nutrient uptake by plants. There is speculation that the mycorrhizal fungi may play a part in terra preta’s ability to seemingly regenerate itself. Modern day producers of biochar (agrichar) take dry biomass and bake it in a kiln to produce charcoal. Biochar is the term not for what is left over after the energy is removed: a charcoal-based soil amendment - this process is called pyrolysis. Various gases and oils are driven off the material during the process and then used to generate energy. The charcoal is buried in the ground, sequestering the carbon that the growing plants had pulled out of the atmosphere. The end result is increased soil fertility and an energy source with negative carbon emissions. Eprida is a company founded by Danny Day, which is attempting to commercialise the idea by building systems that turn farm waste into hydrogen, biofuel, and biochar (see here for a short movie explaining their process). The potential power of biochar lies in this closed loop production process , where agricultural practices involving biochar production see increasing returns of crop yields, energy and soil fertility over time. Biochar also has potential to address problems such as waste disposal and rural development. A significant proportion of the world's population relies on charcoal as a cooking fuel, the production of which drives deforestation in Africa and other places. Replacing traditional charcoal kilns with modern pyrolysis units could reduce the demand for wood from forests by increasing the efficiency of energy production and adding the ability to use any source of biomass, including agricultural waste products. 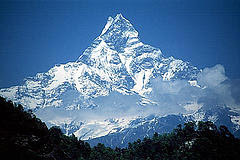 This would also help to reduce respiratory diseases in the developing world, particularly amongst children. There has also been speculation that pyrolysis could be a useful technique for dealing with the huge swathes of Canadian forests that have been killed by pine beetles recently. Some industry participants believe that energy, rather than agriculture, will be the key driver for adopting biomass pyrolysis. Desmond Radlein of Dynamotive Energy Systems has been quoted as saying "It is wishful thinking that people will switch to renewable fuels unless it is cheaper. All of this is tied to the price of oil; as it goes up, many more things are possible." Another company active in the pyrolysis sector is Best Energies. Technical Manager Adriana Downey recently had an interview with Beyond Zero Emissions, talking about some of the pilot programs they have been running and plans to build the first fully commercial scale pyrolysis plant in Australia. The agrichar when it's applied to the soil has a good effect on the general physical structure of the soil. Because the agrichar has a really high surface area, it means that there's lots of pores in the soil which can then retain moisture and act as little reservoirs for the water to be retained in the soil. As well as this, all of the surface area helps to bind nutrients in the soil and also provides a microhabitat for micro organisms in the soil which are essential for the natural processes in the soil which allow micro organisms to flourish. There is a large difference between terra preta and ordinary soils - a hectare of meter-deep terra preta can contain 250 tonnes of carbon, as opposed to 100 tonnes in unimproved soils from similar parent material, according to Bruno Glaser, of the University of Bayreuth, Germany. The difference in the carbon between these soils matches all of the carbon contained in the vegetation on top of them. The ABC's "Catalyst" program last year had a feature on "Agrichar – A solution to global warming ?" (shown below) in the lead up to an international biochar conference in Terrigal, NSW, which included Tim Flannery talking about the potential for sequestering gigatonnes of carbon in the soil. 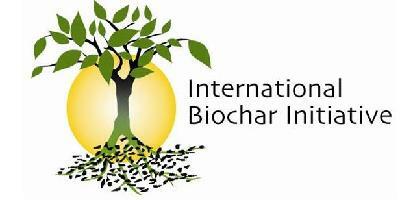 This year's International Biochar Initiative conference has just been held in Newcastle-upon-Tyne in the UK. It is not yet clear what the limits are to how much biochar can be added to the soils using these techniques, however some fairly extravagant claims about biochar's capacity to capture carbon have been made. Soil scientist and author of "Amazonian Dark Earths: Origin, Properties, Management" Johannes Lehmann believes that a strategy combining biochar with biofuels could ultimately offset 9.5 billion tons of carbon per year - an amount equal to the total current fossil fuel emissions. Lehmann also notes that unlike biodiesel and corn ethanol, biochar doesn’t take land away from food production. If true, this would be an interesting form of geoengineering to try and reverse the effects of global warming (and one far less risky than some of the alternatives proposed) but I would still question our ability to turn all the world's oil, coal and gas reserves back into rich soil via burn - atmosphere - pyrolysis loop. * The technology to implement the process is still immature. * Scientists don’t know how much charcoal farmers should use, how they should apply it, or which feedstocks work best. * Farmers are reluctant to spread unproven products on their fields, so the few companies manufacturing biochar have struggled to find buyers. * Charcoal production can generate toxic waste if performed incorrectly. * The energy needed to produce, transport, and bury biochar could outweigh the carbon savings. * Some analysts say the economics of the process will not be acceptable until carbon markets are established, allowing farmers to earn carbon credits for applying biochar to their fields. * Some environmental activists claim that applying the process on a large scale would result in further rainforest clearing which would actually degrade soil quality and increase global warming. Jeff Vail recently had a post on a "Rhizome Template in the Amazon ? ", which looked at a paper by Mark Heckenberger suggesting that a dense civilization of networked villages once existed in the Amazon, which Jeff noted was interesting because it "appears to show a form of organization that permits density without significant hierarchy". The paper shows that the Xingu region of the Amazon was once populated by a grid-like pattern or villages, each connected by a precisely aligned network of roadways (the Xingu river is the Amazon's second longest tributary, with the region currently experiencing tension over plans to dam the river). Here's an alternate mode of organization--a networked "grid," "lattice," or "peer-to-peer" structure of small, minimally self-sufficient villages, or "rhizome" as proposed in my article The Hamlet Economy. The Xingu settlement structure seems to consicously model itself in the latter pattern. Heckenberger even notes that each village was surrounded by a buffer zone of "managed parkland," exactly the kind of fall-back, resiliency-enhancing production zone that I recommended for rhizome. Here's a link to a satellite image of one section fo Xingu settlement. 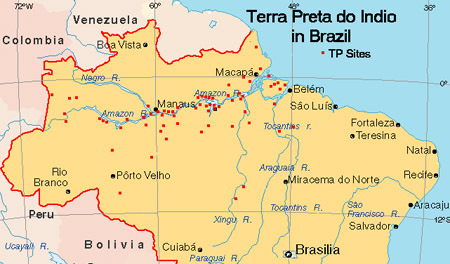 Heckenberger also examined the terra preta pockets in the region, which is described briefly in an interesting article by Charles Mann in The Atlantic Monthly called "1491". Scientific American also notes the correlation between the lost cities of the Amazon and terra preta in "Ancient Amazon Actually Highly Urbanized", as does The Vermont Quarterly in "Pay Dirt". All in all I think biochar is worth exploring further in some depth. Peak Energy: On population growth and the green revolution - "The Fat Man, The Population Bomb And The Green Revolution"
Peak Energy: On worms and soil - "The Turning Of The Worm"
Peak Energy: On Mycelium - "Nature's Internet: The Vast, Intelligent Network Beneath Our Feet"
Excellent composition and overview. Thank you. Also ran across biochar mentions by Pete on the Gardening Australia program and magazine. He's been experimenting with it in his patch and says he got fantastic results with corn, not so much with some other crops. Possibly the best post summary of this process I have read in a single thread. My paper covering the same content was nearly 7 pages. Now I see as pure dribble compared to your focused summary.